This article will detail all the options available in Context or Pop-up menu for a Decision Table. 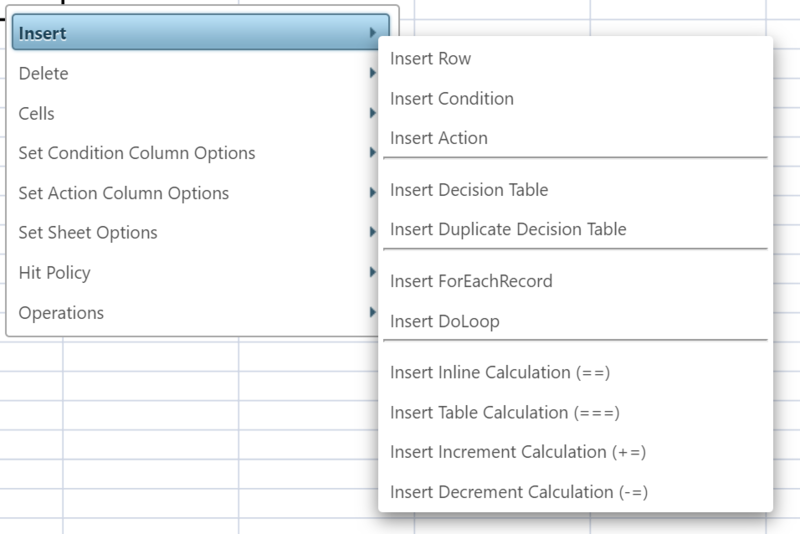 A decision table comes with 35 rows by default, if you need any additional rows you can add them using this command. Just highlight as many additional rows as you want and then click on the Insert Row. If 10 rows are highlighted then 10 rows will be added. Adds an additional Conditions column. Adds an additional Action column. Add an additional Decision Tables sheet to your Decision Table - making it a Multi-Sheet Decision Table. Creates a copy of the current Decision Table sheet. Adds a ForEachRecord column into the Decision Table. Adds a DoLoop column into the Decision Table. Adds a calculation column, whose final value is output as a variable that can be used in subsequent parts of a Decision Table formula. Used only when there is a ForEachRecord or DoLoop column in the Decision Table. Adds a calculation column that is calculated outside of the loop and whose final value is output as a variable that can be used in subsequent parts of a Decision Table formula. Adds a calculation column, which will increment in value for each row that matches the conditions, and whose final value is output as a variable that can be used in subsequent parts of a Decision Table formula. Will only work when the sheet Hit Policy has the Exit this Decision Table on First Match unchecked. Adds a calculation column, which will decrement in value for each row that matches the conditions, and whose final value is output as a variable that can be used in subsequent parts of a Decision Table formula. Will only work when the sheet Hit Policy has the Exit this Decision Table on First Match unchecked. Deletes the selected row of data. Deletes the Decision Sheet you are working on. These work exactly like the standard Windows Excel style Cut, Copy and Paste functionality. Reverts back or change columns into a standalone condition. 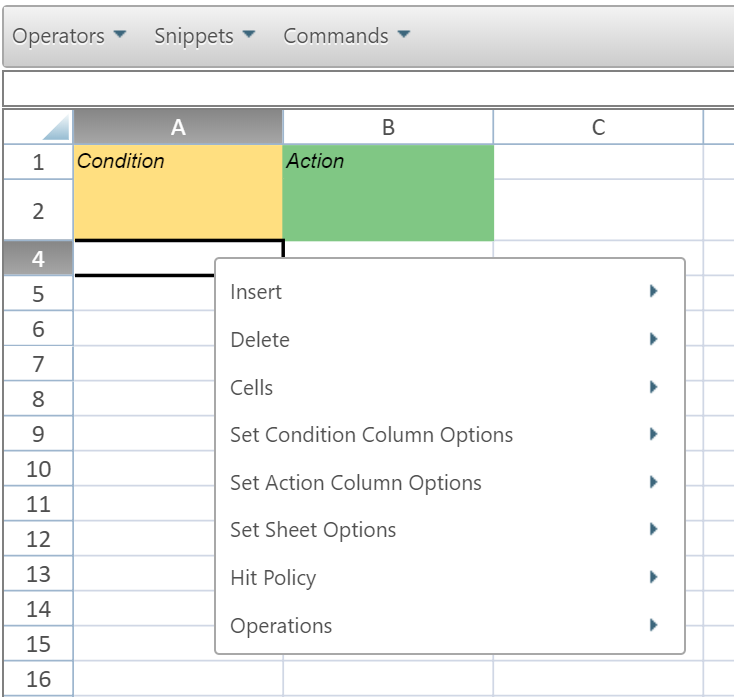 Combines Conditions Columns together into an OR condition. Encloses two or more columns together in brackets. These Columns are then separated by AND conditions. Enlcose two or more columns together in brackets. These Columns are then separated by OR conditions. Please review this article for more information on how to configure OR Conditions. Allows you to carry out ClientSide actions, only relevant for when Mode is set to Clientside. Allows you to carry out ServerSide actions, only relevant for when Mode is set to Clientside. Change the sheet behaviour to allow for Creation of records. 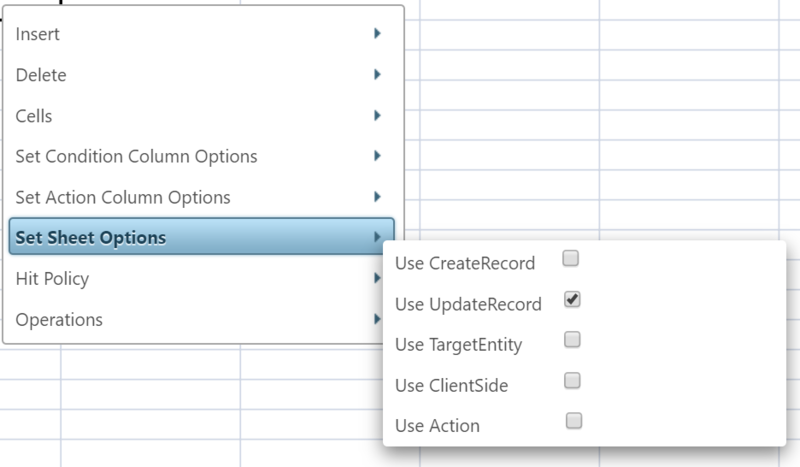 Change the sheet behaviour to allow for Updating of records (this is the default setting). Change the sheet behaviour to allow for updating of data before it is committed to the database. Change the sheet behaviour to use the SetClientSideField() function rather than the default UpdateRecord() function. Use ClientSide will be selected by default for formulas with a Type of ClientSide Perform Action. Change the sheet behaviour to use the SetActionOutput() function for any field references. This command tells the Decision Table to stop checking conditions once it finds it first success. By default this is turned on - however you may not always want this feature turned on. For example if you have several independent updates executing at the same time. Instead of creating several different formulas you could instead create a single decision table and put all the logic into it. As long as the Exit on First Match is turned off the Decision Table will execute the actions for all conditions that are fulfilled. This command is used in Multi-Sheet Decision Tables. If it is turned OFF then when the Decision Table has finished processing the current Decision Sheet, it will move to the next Decision Sheet in the Decision Table. However if it is turned ON - then the Formula will fully exit on this Decision Sheet and not execute any additional Decision Sheets afterwards. This command shows/hides values stored in row 3. You will see the full names of any fields being used in the Decision Table and be able to set default values for them. Please click here for more information on setting default values. It also shows/hides the Global Calculations and Global Actions sheet tabs. 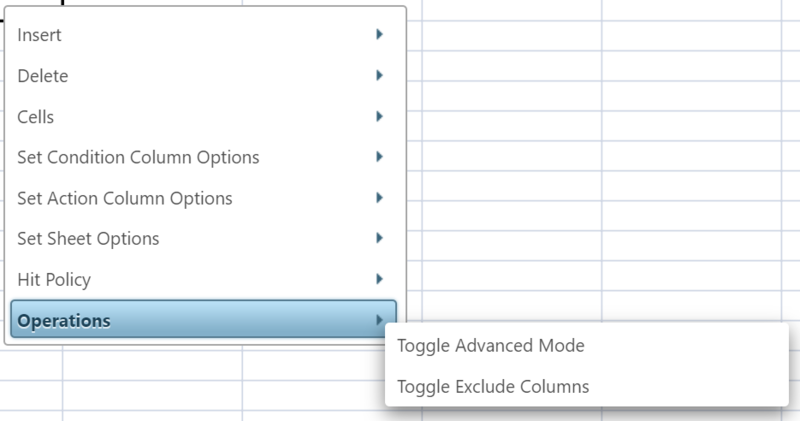 If you would like to exclude a column from executing you can click into the column and select this option. Select it again to include the column again. This option is useful when you temporarily need to exclude logic for testing purposes.